I know, I know you've been sat there looking at the blog wondering when I might actually write something again! Apologies. As you can imagine, moving house, moving country and getting settled into a new job has been pretty crazy. It's now, 2 months on and I'm finally able to sit down and write on here again! Hurrah! My first post back is about "Just For Tummies". Now, this may not sound all too exciting however it really is worth having a little read, so stay with me. Question 1: Do you take a daily vitamin supplement? You do, Great! But do you take it every day? Question 2: Do you take a probiotic every day? No... Then why not? When we moved to Dubai, all those years ago. I found out pretty quickly that I benefited healthwise by taking a daily probiotic. I don't know what it was about Dubai but when we lived there I just tended to pick up every single bug going and was often quite poorly. In 2014 I became pregnant with Little Un and I continued taking a probiotic every single day. There are mixed views on whether you should take probiotics when pregnant. Personally, I found that it really helped me and it also helped to keep tummy bugs at bay! When I moved back to the UK I continued to take a probiotic. However, maybe not as regularly as I had before. I sure as heck noticed a difference in my health when not taking a probiotic as I felt bloated at times and I felt sluggish in myself. When the email dropped into our inbox saying "How would you like to move to Oman?" I decided that it was time to do some research again regards probiotics and health as I didn't want to get poorly when I moved back to the Middle East as I knew that I'd be jumping straight into my new job at HiFM. 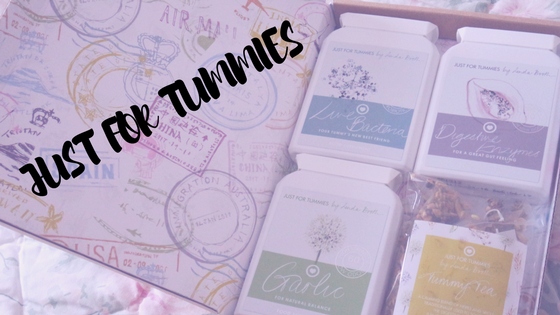 After doing some research I came across "Just for Tummies" They do this AWESOME set of goodies for your tummy in a special Travel Set. If you ask me the Travel Survival Kit is a MUST HAVE for anyone who's travelling a lot with work or for anyone off on holiday abroad anytime soon. Let's be honest it's pretty much always guaranteed that when you travel with work you get asked out for meals or maybe whilst you're away you treat yourself to meals in the restaurant because it's at the companies expense. It's the same too when we go on holiday, we look at the menu and think why not and treat ourselves! Therefore this often means lots of heavy meals such as Steak with creamy mash potato or big portions of curry etc. 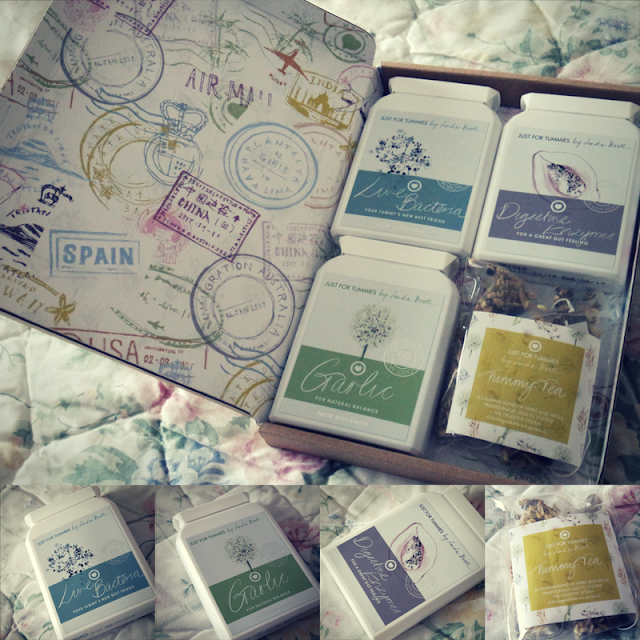 the Travel Survival Kit from Just for Tummies has thought about everything you may need whilst away from home. The Digestive Enzymes tablets help your tummy digest heavy meals and deal with the richer food that you might be consuming whilst away. You just take these ahead of your meal and the clever little tablets help beat the bloat. Also in the Travel Survival Kit are Live Bacteria Tablets. These are a must and must be taken daily as they'll help your tummy stay strong when you're maybe eating lots of different food types or if you drink different water. Now you may look at the kit and think why the heck is there a pack of GARLIC TABLETS in there. Well let me tell you Garlic is natures antibiotic and it helps keep bugs are bay and as well as keeping your tummy in check it helps the body to fight off colds. So Garlic Tablets are a must if you're travelling. Finally introducing the Tummy Tea. This is my favourite product in the kit. It's the most calming and soothing cuppa ever. If you follow me on Instagram you'll know that I'm a MASSIVE tea fan. This tea is just perfect if you feel like you've overindulged the night before or if you feel that your tummy needs a little bit of TLC. It's a hug in a mug and super soothing and comforting if you ask me. So what do I think to the TRAVEL SURVIVAL KIT? I genuinely love this kit. I've been taking a Live Bacteria Tablet every day and I've taken the Digestive Enzyme tablets when eating heavy meals like curries out here in Oman and I feel that these tablets have really helped to keep bugs at bay and helped me beat the bloat. I'm super impressed. Also the lady behind the brand the lovely Linda Booth really is a lady in the know. If you suffer from IBS, Crohn's Disease, Ulcerative Colitis or just need advice on the digestive system get in touch with her and definitely check out her website and blog as there's lots of helpful advice on there. A lot of peeps who read my random blog posts live in sunny Nottinghamshire. (My hometown.) The good news is that Linda Booth and her clinic are in Nottingham so if you wanna find out more get in touch and if you live a little further afield you can order any of her products online. My next mission... to find out if I can get these tablets shipped to Oman!